The creator of this seed bank is called Soma and he is breeding hemp seeds since the beginning of the seventies with a lot of success. Before he started his first grow and long before he started to produce his first weed seeds, Soma was working for IBM. Soma was always "bio" so he also produces his hemp strains as much as biologic as possible. 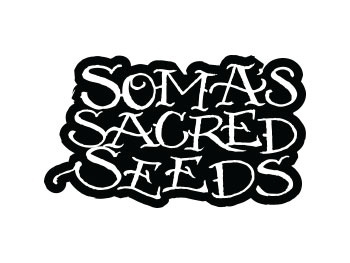 If you buy "Soma Sacred Seeds" you buy something great, Soma is one of the best and most reliable breeder of cannabis seeds on our very nice planet earth. White Willow reg named after Somas daughter who is quite a strong human being. The buds become covered in a carpet of crystals, has an intensive Afghani-sweet smell and delivers you a strong high. Sog G Kush fem is a hemp plant, which is a cross between „OG Kush x LA Confidential x Trainwreck “. This Lady delivers you an intensive smell, produces strong branches and comes to flower after about 10 weeks. SoGouda is a hemp plant, which is a cross of „Blueberry x Cheese x G13 Haze“. This strain comes to flower after about 9 to 10 weeks and is mostly Indica. Somango is a hemp plant, which is a cross between „Big Skunk Korean x Jack Herer “. The buds become covered in a carpet of crystals, it comes to flower after about 66 days and delivers you a typical mango taste and aroma. Somaui reg is a hemp plant, which is a cross between „G13 Haze x Hawaii “. This Lady is not recommended for amateur growers, delivers you a sweet flower smell and comes to flower after about 12 – 14 weeks. Haze Heaven reg is a hemp plant, which is a cross of „Northern Lights #5 Haze x Afghani Hawaiian“. This mostly Indica Lady delivers you a great harvest, is well suited for connoisseurs and produces many resin coated buds. Amnesia Haze is a hemp plant, which is a cross of „Afghani Hawaiian x Laos x Jamaica “. This Lady comes to flower after about 84 days, is mostly Sativa and delivers you an average yield.